In the 21st century, India is touted as the land of ‘spiritual tourism’. One cannot go a few kilometres without finding a temple or other dharmic structure. Indians have been called as relentless temple builders by medieval tourists. A temple is not just a brick and stone structure. It functions on various other planes than the formal religious one. When a social institution develops around the sacred precincts of a temple, it becomes a ‘Matha’ or an ‘ashram’. Most of the big temples in ancient and medieval India were part of this bigger entity called Matha. A Matha is a spiritual and religious establishment of dharmic traditions including Jainism and Buddhism. It is a place where saints and meditational practitioners following the dharmic code, reside around a temple, living the life of meditation, quiet reflection, with the goal of self-realization. It is a vast and complex spiritual, religious, cultural and socio-economic entity. A Matha is a dharmic monastery with a temple or many temples at its centre. The temple is of a dominant deity and sect, but most of these temples have subsidiary shrines of other deities too. The Matha is a centre of learning. It is also a home for many saints and spiritual seekers who learn to practice meditation and study Shastras such as Vedas, Upanishads, Agamas, Nigamas and so on. The Matha is a socio-economic entity. There are many cottage industries within a Matha, using the produce of its farmlands. The local people are engaged in this micro-economy. They till the land of the Matha which is given to them on lease. They grow produce for themselves, the Matha and also for selling in the market. The Matha combines agriculture, industry and trade, based on indigenous methods. schools for poor children, for differently-abled and other marginalized sections of society. hostels for those children who cannot afford it. old age homes for the elderly, widows and orphans. hospitals for the benefit of the poor sections of the society. Goshalas for the preservation of indigenous breeds of cattle and for propagation of healthy food habits. The Matha is a centre for the preservation of the cultural heritage of the country. Every Matha has a temple at its centre. 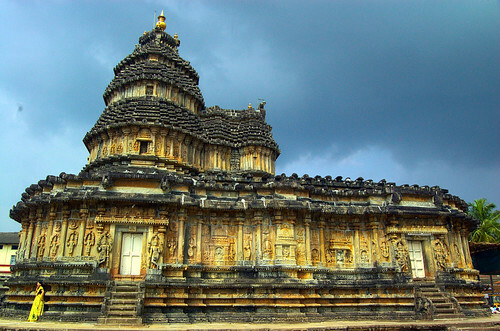 A Hindu temple combines architecture, sculpture and painting in one exquisite structure. Not only this, it also incorporates performing arts such as music, singing and dancing. 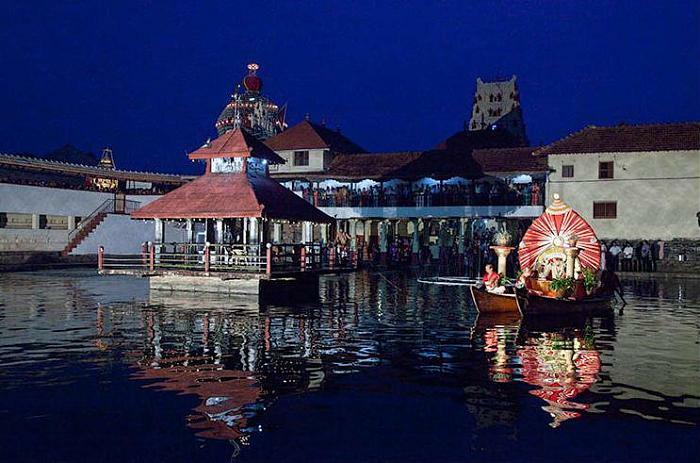 Most of the temple and the Mathas have been centres of cultural activity for ages harbouring great artists and giving them a livelihood and a platform to perform. The Matha is also a centre for great literature. Saints and scholars study and meditate in these Mathas and create great literature for the benefit of the posterity. The Matha is a centre of charity. People give charity to these Mathas in money and in kind. The Mathas get charity from the rich as well as the poor. In the past, kings and the administrative authorities also gave grants to the temples or the Mathas. In turn, the Mathas help the poor of the society with this charity. Most of the beneficiaries of this system are the poorest of the society. In this way, the surplus wealth of the society is redistributed in the society through the agency of the Mathas. Till independence, Mathas functioned as the legal aid clinic for the rural population. In some cases they still do. Just about 100 years ago, people in the rural areas looked towards a Matha for solving their disputes based on ethical and moral standards as laid down in the Shastras and interpreted according to the needs of the time. The Mathas also function as a Social Security system. They help in times of emergencies like floods, famines, epidemics and other such emergencies by providing relief work. They help the poor, the marginalized and the downtrodden. It would not be an exaggeration to say that till recently, the Matha was one of the most important institutions of India. Since independence its authority has decreased a little but it is nowhere near insignificant. The most beautiful thing about a Matha was that despite being a spiritual, religious, cultural, socio-economic, social welfare and paralegal institution, it was never a political institution. It is quite unlike and the exact opposite of the Church in Medieval Europe and the equivalent institution of the Ummah in Islam. These two entities functioned as different kinds of institutions at different times; but one thing was always common in them. They were always highly political, interfering in the affairs of the State, dictating political terms and even forming armies of their own and clashing with the State with rival claims on power and property. The importance of the Matha in Indian social life was not missed by the foreign invaders of India. In the north, the Mathas, both Buddhist and Hindu were primary targets of the Islamic invaders as it was understood that destroying a Matha amounted to destroying the spiritual, cultural and socio-economic node of the society. Many Mathas were destroyed by the ravaging Muslim armies in north India and this destruction consequently affected the life of the people too. In the north, after many centuries of Islamic invasion and destruction, the institution of the Matha deteriorated and the term ‘ashram’ has become more popular. In the south, where the Hindu traditions have gone almost undisturbed for thousands of years, the institution of Matha continues in its ancient glory with even its name intact. To sum up, the Matha emerged as the central definitive institution dominating the social and economic life of India. Not only was it central to the spiritual life of people, it was also central to their social and economic life. Wherever it was left untouched and the tradition remained undisturbed, the Matha developed to incorporate the whole city within its confines; Srirangam in Tiruchirapalli being the primary example. Any understanding of Indian society without an understanding of the Hindu Matha, will be incomplete. So far, not many efforts have been done to see the Hindu temple as a living system, as a platform where arts, humanities and sciences came together with people from every walk of life and created an institution unprecedented in human history. This article aims to take one step in that direction. R. Chamapakalakshmi. The Hindu Temple. New Delhi: Roli and Janssen, 2007. p. 13. Pankaj Saxena is a scholar of History, Hindu Architecture and Literature. He has visited more than 400 sites of ancient Hindu temples and has photographed the evidence. He’s also writes articles, research papers and reviews in various print and online newspapers and magazines and is the author of three books.